This smaller version of the already industry proven 2″ NPS/BSP threaded (25cc or 50cc) Quantum Sampler has been designed and built with the same emphasis on reliability and ease of use. It is also operated and maintained in exactly the same way. The Mini Quantum Sampler comes standard with either 1″ NPS or BSP threaded process connection and is fitted with EPDM process seals. 316 Stainless Steel is used for all process wetted parts and an alloy air cylinder barrel is standard. FRP air cylinder barrel, different process seal materials (eg: Viton) and almost any type of process connection are available on request. The Mini Quantum Sampler also comes standard with an internal 316 S/S wear sleeve, and has a 3/4″ NPT sample discharge tube. It will takes a 10cc sample of your process stream with each stroke. 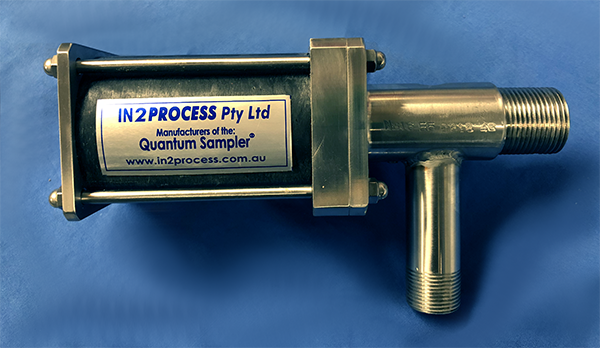 The Mini Quantum Sampler can be customised to suit your needs. This makes the product even more valuable to your organisation.